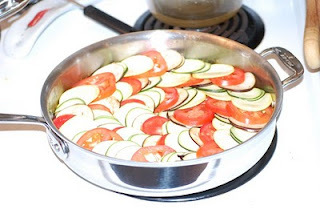 I asked Craig if he would cook on his day off, so he said "I want to make Ratatouillle". and I got to choose the recipe. 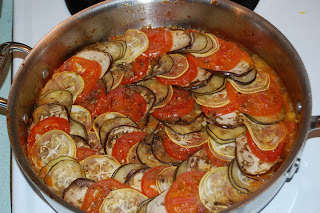 So those of you who know me, know I LOVE Pixar movies, so naturally I would select the recipe from the movie Ratatouille! (Hahaha it might have been the hardest recipe he has EVER made, next to the Martha Stewart candy debacle (de·ba·cle-diˈbakəlNoun; a fiasco) of 1998!, right Tonya!!) (wanna know, gotta ask!) So far, it smells INCREDIBLE.